Dangerous Defective Products: Who is the REAL Monster? We are constantly paying attention to what we eat and consume and the products we use—and with good reason! As a society, we are becoming more concerned with the chemicals, preservatives, and artificial sugars that are in our foods and products—especially as more and more research and studies prove that these chemicals only contribute to big health problems. As a result, there have been more lawsuits pinning larger companies for defective products. One such company that has been in the news recently with yet another lawsuit over their head is Monster Energy. These lawsuits filed in Florida allege that Monster energy drinks are responsible for failing to warn consumers about the caffeine levels in their beverages, which can contribute to kidney failure, strokes, and heart attacks. This is just the latest of injury lawsuits filed against Monster Energy, and hundreds more are anticipated. Several individuals who have filed claims against Monster Energy allege that serious medical conditions have resulted after their consumption. Some individuals in the medical and health field are not surprised to hear about these issues, given that the drinks are marketed to boost energy. Frequently, products like this meet that claim by filling the drinks with high levels of caffeine or supplements. A user might not even realize the risks he or she is exposing their body to until it’s too late. As a result, lawsuits are brought in order to hold the company accountable and stop the production of potentially dangerous products. Check out this site here to read more about the most recent lawsuit against Monster Energy. Company or Caffeine: Who is the REAL Monster? Since each Monster Energy can of 16 ounces has 160 ml of caffeine, the lawsuits claim that consuming these drinks on a regular basis can contribute to renal failure, heart attacks, and strokes. The caffeine inside a Monster Energy drink is equal to about four cans of Coca Cola. The lawsuit alleges that Monster Energy drink did not properly provide warnings about the possible side effects associated with habitual consumption. Young and healthy individuals with no other apparent problems have suffered critical injuries and medical conditions after consuming Monster Energy drinks on a regular basis. Monster Energy drink was initially marketed as a dietary supplement in an effort to avoid traditional regulatory oversight by the Food and Drug Administration. The Food and Drug Administration has strict limits about the amount of caffeine that can be inside soft drinks. After being labeled and approved as a dietary supplement, Monster Energy drinks marketed the product as a beverage in order to avoid reporting any issues associated with adverse health effects to the FDA. The lawsuits allege that the company’s determination to avoid regulation at every possible turn has ended up harming those who consume the product. Lawsuits like this have been on the rise in recent years particularly after a 19 year-old individual suffered from cardiac arrhythmia after having two cans of Monster every day over a three-year period. The consumption of this product has also been linked to at least five other deaths across the country and an increase in emergency room visits. As all of the details surrounding Monster Energy and their potential are not yet known, you may wish to consult with your medical specialist and a personal injury attorney. 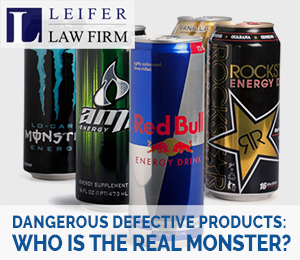 You may have grounds for a lawsuit against the manufacturer of dangerous drinks like Monster, especially if you believe you have sustained serious medical conditions and injuries as a result. Read more about defective products and personal injuries here. If you have suffered as a result of a defective or dangerous product that the company should have warned you about, you may be eligible to file a personal injury lawsuit in Florida. Consulting with a Boca Raton personal injury attorney should be the first thing you do. Visit here to learn more about working with a Boca Raton personal injury attorney.